What is today India was divided into a Hindu south, into a majority of states belonging to the Islamic Mughal empire in a central belt, and a group of territories adjoining in the north. In monetary questions the northern kingdoms seem to have been independent yet influenced by the stable coin of the Mughal empire. The Hindu south, mostly under the sway of the Vijayanagar kingdom, preserved a gold standard with the Pagoda or Hun as the leading currency unit, while the northern Islamic countries had mixed systems privileging silver as the standard. Several European powers established their own mints on the subcontinent to address the local markets with coins fitting into the regional patterns. Prominent were the Portuguese in Goa; the British issued their variety of southern Indian coins with the beginning of the 1630s at Madras and after 1742 also at Chintadripet. Their expansion into the Mughal Empire beginning in the late 1750s was less peaceful - Calcutta became their base here. The Danes had their base since 1620 at the delta of the Cauvery river, some 10 km north of the French enclave of Karikal and 30 km of Negapatnam on India's Coromandel coast - these powers again offered local varieties of coins especially minted for the trade with India. Kutch have issued a Kori divisible into 4 Payalo, 8 Dhabu or 24 Dokda. The Islamic Mughal (other spellings Mogul, Mogol, Moghul) empire was founded in 1526 by Zahir-ud-din Muhammed, "Babur" (Tiger), a chaghatai Turkish ruler of the Tamerlan family, who had invaded India several times before from his capital at Kabul before he managed to defeat Ibrahim Lodi, the last of the Delhi Sultans at the First Battle of Panipat. The list of rulers is up to the troublesome period from 1707-1719 short: Babur (1526-30), Humayun (1530-1556), Akbar (1556-1605), Jahangir (1605-27), Shah Jahan (1628-58), Aurangzeb Alamgir (1658-1707) – the history of the political entity everything but one of peace: Foreign powers posed a continuous threat; internal revolts followed with the spread into hindu kingdoms; religious and political conflicts contested the central power; last but not least: the military invader risked an enormous potential for dynastic strife being hardly able to justify its power within or without. The long and everything but stable reign of Aurangzeb brought the greatest expansion of the Mughal empire and lead into a period of bloodshed among the prospective successors: Bhadur Shah (1707-1712) who succeeded Aurangzeb had to face a Sikh revolt. His successor Jalandhar Shah (1712-1713) was killed by Farruksiyar who ascended the throne in 1713 yet turned out to be under the control of the Sayyid brothers, who had become the secret king makers. Revolts of the Rajputs, Jats and Sikhs marked his short reign till he was murdered in an intrigue instigated by the Sayyid brothers in 1719. He was followed by Muhammad Shah (1719-1798) under whose rule the territorial disintegration got on its way. Hyderabad, Avadh and Bengal established independent kingdoms. 1739 saw a Persian invasion, 1756 the looting of Delhi by an army of Ahmad Shah. The British East India Company defeated a combined Mughal and French force in 1757 and won British supremacy in Bengal (Calcutta and the surrounding area). Britain began to seize power and became India's factual ruler who could finally officially dissolve the Mughal empire in 1857. 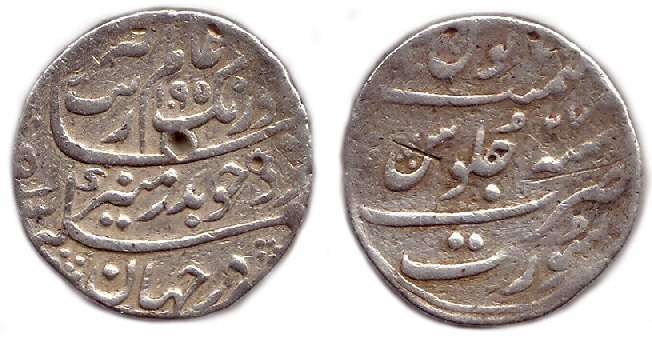 Silver Rupee, Emperor Muhamed Aurangzeb Alamgir (1658-1707), AH 1095 = AD 1683, 25 mm, 11.5 g, Islamic inscriptions on both sides. Important coins were the gold Mohur, the silver Rupee (divided into 16 Annas) and the Anna (12 Pies). Copper coins were the Pice (of 3 Pies) and the Pie. The regular conversion rate seems to have been at 10 Rupees against 1 pound sterling or 10 Dutch gulden against 9 Rupees - a rate which can be supported by coin evaluations. In southern India silver as a part of the currency system seems to have been quite unknown. Most of the territories south of the Mughal empire were united under the rule of the Vijayanagar kingdom - enjoying full sovereignty in questions of monetary politics. The main currency units were the Pagoda or Hun divided into 36 Fanams, the Fanam divided 4 Faluce or into 80 Cash (copper). The rates do, however, seem to have varied and we have not found accurate information for the 18th century or the modalities of exchange with the northern neighbour. French India, Pondicherry including Mahe, Yanaon, Karikal, and Chandernagore issued from 1700 to Dec. 1871 a rupee fixed at 1 silver French rupee = 1 silver Indian rupee = 10.9g silver. A mint was opened in Pondicherry and operated until 1793; thereafter French rupees were minted in France until 1840. The unit of account and subdivisions were 1 French rupee = 8 fanons = 16 annas. At times the mint also struck gold pagodas. In 1639 the Vijayanagar kingdom had granted the East India Company the privilege to mint coins according to its laws. Minting of British gold for purposes of commerce with the region began in the early 1640s. English supervisors run the mint at Fort St. George in Madras from the 1650s onwards. The standard remained the Vijayanagara gold Pagoda or Hun. These became known as the Old Pagodas when the New Pagodas, the Madras Pagodas of lighter weight and less value, came into currency. Fanams (Panam) first in gold alloys were minted as small coinage, initially in gold and from 1688 onwards in silver. From 36 Fanams to a Madras Pagoda, the value changed bit by bit over the years to 32. Also minted were Cash and Doodoos (Kasu and Dhuttu) in copper. A Fanam which first started out at 80 Cash was revalued over the years till it became 60 Cash and the Doodoo changed in value from an original ten to a Cash to eight. These exchange values remained more or less the same till the considerable changes in the early 19th Century. In 1692, the mint was permitted to issue the silver Rupees of the Mughals. The public were also encouraged to take their own gold to the mint and have it converted into Madras or Arcot (Mughal) currency for a mintage fee. The standard weight was expected to be strictly observed. A new mint was built in the Fort in 1695, then rebuilt in 1727 in the northwest corner of the Fort, by what became known as the Mint Bastion. In 1742, a second mint was established in Chintadripet. The same year, the Fort mint was permitted to strike the Arcot Rupee and Arcot coins of lower denominations. Needleman, Saul B., "Coins of European Concessionary Trading Enclaves in India", Chatter, ed. by the Chicago Coin Club, vol 46, no. 2 (February 2000) link. Datta, Rajat, "Markets, Bullion and Bengal's Commercial Economy: the Eighteenth Century Perspective", in Om Prakash/ D. Lombard (eds. ), Trade and Culture in the Bay of Bengal, 1500-1800 (Delhi, 1999). Rothermund, D., An Economic History of India 2nd edition (Routledge, 1993). Subhramanyam, Sanjay (ed. ), Money and the Market in India, 1100-1700 (Delhi, 1991). Pearson, M. N., Before Colonialism: Theories on Asian-European Relations, 1500-1700 (Delhi, 1989). Perlin, Frank, "Money-use in Late Pre-colonial India and the International Trade in Currency Media", John F. Richards and Joint Committee on South Asia, The Imperial Monetary System of Mughal India (Delhi/ New York: Oxford University Press, 1987). Raychaudhuri, Tapan/ Habib, Irfan (eds. ), The Cambridge Economic History of India, vol. 1, c. 1200 - c. 1750 (Cambridge: Cambridge University Press, 1982). Bruce II, Colin/ Deyell, John S./ Rhodes, Nicholas/ Spengler, William F., The Standard Guide to South Asian Coins and Paper Money since 1556 AD (Krause Publications, 1981). Gupta, Ashin Das, Indian Merchants and the Decline of Surat, c. 1700-1750 (Wiesbaden, 1979). This page was last modified 19:15, 3 April 2008. This page has been accessed 92,998 times.